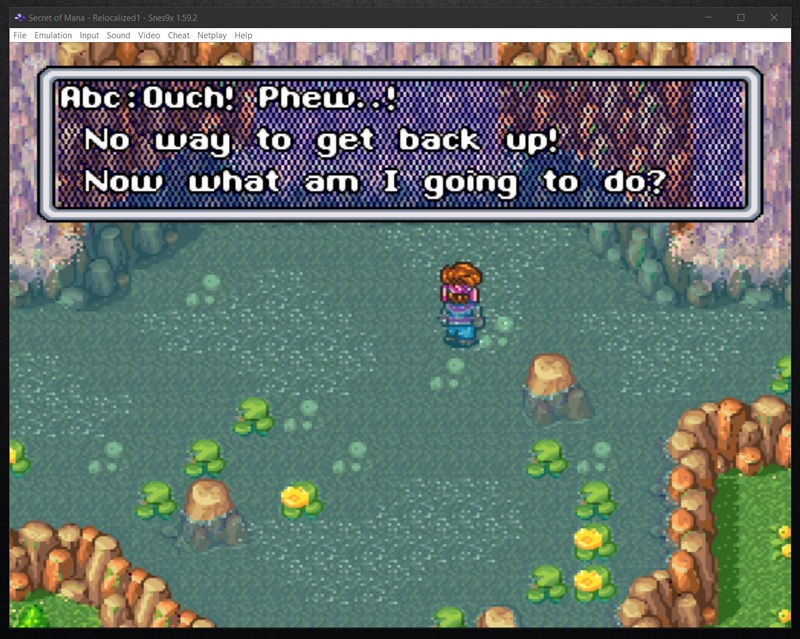 Legend of Mana/Seiken Densetsu IV I believe. Okay. I'm going to break this down for you because I have a lot of respect for you as a creator. I'm not doing this to be disrespectful so please forgive me if I sound hurtful. It's not intentional. In fact, I'm grateful for the mental exercise this has been. I can be kind of long winded so check the spoiler tag for this explanation. Technically, that sentence works. Can you keep a straight face and tell me that sentence doesn't feel totally forced? My guess is no. Not only is it awkward, it doesn't explain why you're shaking loose a rock. In my truncated sentence, the target of the spell, the enemies, is implied. "Crush under falling rocks." Is essentially "Crush <your enemies> under falling rocks." Graphically this spell shakes the screen and creates a rumbling sound before dropping a boulder on a target. Even though, the earthquake itself isn't mentioned in the description it's more than implied by both the name and the effect of the spell. If I had more space I would describe it as "Quake the earth and unleash a rockslide to crush your enemies." Now, to be fair I really tried to make this work and eventually stumbled onto this gem. "Quake <or "Shake"> loose rocks & crush." Unfortunately, there's still some ambiguity there though. Are we shaking some loose rocks or are we shaking rocks loose? More importantly, the simple truth is neither description is as effective as "Crush with falling rocks." and an implied earthquake. Now in other news. 1.6 is almost ready to go. We're trying to figure out what is causing the right aligned text in shops to move to the left. Once that's done, I'll release the update. Mixed case character naming now possible. Gigas whip renamed Gigas' Whip. Sleep reverted back to Sleep Flower. Spell descriptions have been truncated to allow for room for statistical data. Minaturized was broken down to "Shrank/Shrunk". I had to polish up my native English language skills for this one. It turns out shrink, shrank, and shrunk are actually pretty damn difficult to conjugate. On the Status Screen it is displayed as Shrunk and in system messages it is displayed as "Shrank". The Gigas Whip, the last holdout of the Gigas nomenclature, got a little update as well. Check the spoiler flag for an explanation. Gigas is an improperly used word for Giant in many Japanese video games. In Greek mythology Gigas is one of the Gigantes. The Gigantes aren't always even gigantic in size. In the last update I renamed the Fire, Frost, and Thunder Gigas' from Gigas to Giant. Earlier updates modified the Gigas Sword to Surtr's Sword, Gigas Lance to the Giants' Lance, and the Gigas axe to the Demon Axe as was appropriate to their translation. This left only the Gigas Whip which I intentionally left intentionally as it is an accurate translation. Only, I forgot to properly punctuate it as a specific person's weapon. Thus, Gigas' Whip. I've been listening to a lot of the feedback. I'm going to save some more of the radical localization for World of Balance. I reverted Sleep back to Sleep Flower (Where it will stay even in World of Balance.) Though this has brought into question a couple of other localization choices that I've made. Initially, I shortened "Dispel Magic" to "Dispel" instead of reverting it to the Japanese "Anti-Magic" for a few reasons. First, because Dispel felt more like a verb then Anti-Magic. Second, because the "Magic" part of "Dispel Magic" felt redundant with "spel" being right there in the verb. Finally, because when I first started I wasn't able to restore "Wall" to "Counter Magic" because of space limitations that haven't applied since Mziab first expanded his Script Injector to help out. "Wall" as mentioned above was changed to "Reflect" because after Mziab adjusted his script injector, I forgot about it. As stated above, it's literal translation is Counter Magic. I stand by the other literal translations that I've made regarding spells. Click the Spoiler Flag for further explanation. "Energy Absorb" is actually スポイト or spuit which is a Dutch word for syringe and a common Japanese misnomer for a Pasteur Pipette (A device found in the spell's icon). It's a tool which is commonly used to draw and transfer liquids. "Drain" is very much an acceptable localization for it. I relocalized "Change Form" to "Transform" because it's better. In Japanese, the spell is called "Body Change" and "Transform" is still better. "Silence" was changed to "Confuse" because of the main effect of the spell. This was also relocalized in the English remake. "Speed Down" was changed to "Slow". This was done because I changed "Speed Up" to it's literal translates "Quick". I felt that "Slow" and "Quick" were cleaner and less awkward than "Speed Up" and "Slow Down". I think all of the other spells are either changes back to the literal translation or grammatical changes. I'm sorry about the delay to what should hopefully be the final update to Relocalized. On the bright side, it is kind of blessing in disguise because it allows me to get some feedback on "Dispel" and "Reflect" aka "Anti-Magic" and "Counter Magic". What do you think, should these spells be delocalized back to literal or kept in their current relocalized forms? Finally, while I'm thinking about this. For the Japanese fluent. Would Temple be a better translation for 神殿 than Shrine? That's not necessary because a flail is not a whip. They completely different weapons. Fair enough. I appreciate your candor. A second suggestion I was going to make, but decided not to was to just drop the descriptions entirely and let the spell effects and names speak for themselves. You have to admit that some of them are kind of wierd and awkward in their own right. Earthquake shakes the screen and then a boulder practically leaps up out of the ground and lands on the target. That's not how earthquakes work in general. You can give leeway for it being magic, but there is very little space left to describe such an odd occurrence. Personally, I would consider just dropping them altogether in favor of listing any elemental/status effects and call it a day. But that's just me. Dispel and Reflect sound great to me. I tend to like spell names that do a good job of describing the spell effect by itself. That's why I dislike Earthquake in this case. The earthquake is just the prelude to the ground spitting up a rock. I don't see it as worth mentioning, really. What's more it gives me a bit of cognitive dissonance since most spells named earthquake usually do direct damage and cannot hit floating or flying targets. However, this spell can hit those types of targets. I guess what I'm saying is that if Dispel, Reflect, and Slow are merited changes, then changing Earthquake may be just as meritorious. Rock Crush would eliminate that dissonance, it actually describes what is happening enough by itself, and may even eliminate the problem of the truncated description. The price window bug has been located and squashed. I'll be compiling the changes and uploading it to the Queue tonight. Unless more typos are found in the script. This is probably the final update for Relocalized. -Fixed the Price Window Bug. -Mixed case character naming now possible. -Removed the last remaining reference to Popoi's gender in the script. -Spell descriptions have been updated to allow for room for statistical data. -Reverted back to old punctuated message system (due to demand). -Miniaturized was to long. It's system message was changed to "Shrank!" -Miniaturized's status was changed to "Shrunk". -Unconscious was too long. It's system message was changed to "Asleep!" -Unconscious' status message was changed to "Asleep"
-Burning's system message was localized to "Ablaze!" -Burning's status was localized to "Ablaze". -Gigas whip was corrected to Gigas' Whip. -Diamond Missile was localized to Diamond Shards. -Freeze was modernized to Ice Smash. -Detect was localized to Analyze for comprehensiveness. -Sleep was reverted back to Sleep Flower because the change was unnecessary. -Dispel was reverted back to Dispel Magic because the change was unnecessary. -Royal Jelly was modernized to Honey Brew. I went a little wild with some of the changes that I made with version 1.5. I have corrected course with version 1.6. This time I vetted a lot of my against both public and private feedback and I made sure that both new and old changes were justified. I have modernized a few spell names this time around. These changes are consistent throughout the Japanese series. There are a few changes I will discuss below. All of the other changes were grammatical in nature. "Diamond Shards" was chosen over "Diamond Missile" because when most people hear the word missile, they think of a guided rocket propelled explosive. D&D players are the exception here because of Magic Missile. "Slow" was localized from "Speed Down". It "Slow" is more concise. "Drain" was chosen over "Spuit" because not only is "Spuit" an inaccurate translation from Japanese the proper words "Pasteur Pipette" or "Eyedropper" is pretty 4th wall breaking or totally awkward and weird in context. So, despite the of the dropper on the I localized it to "Drain" because it was better than "Draw up". "Analyze" "Detect", while being technically adequate, is not the best word for what is going on with the spell. "Analyzer" was a better localization from the start. I just dropped the "er" for consistency with the other spells. Consider this a reversion. "Reflect" Is "Counter Magic" a better name for this spell? Maybe, but I didn't really have to think about it because there was no good way to include it in "Dispel Magic's" overstuffed spell description. "Reflect" was chosen for it's short length. "Twinkly Barrier" I've already talked about this. Tinkly has a very juvenile connotation in English and needs to be localized. "Twinkly Barrier" is more accurate and more comprehensive than "Lucid Barrier" as the former refers to light and the latter refers to sound. "Earthquake" Vanya, I like you but I'm not budging on this one. This spell is consistently called "Earthquake" in every other entry in the Mana series. It is not a misnomer. I don't believe that the graphics are different enough to justify changing the name of the spell. "Ablaze", though not a spell, got a last minute localization. While reworking the system messages, someone suggested this gem. Apparently, the HD Remake actually uses this for it's status effect notification and to be honest it works a whole lot better than "Burning" and is far more comprehensive than "Engulfed". I worked really hard over the last few days to get these spell descriptions as close to literal as they are within the 43 character threshold. I'm pretty proud of this effort. "Earthquake" Vanya, I like you but I'm not budging on this one. Lol. You made me chuckle. Great work on everything. I'm quite anxious to get to playing this. Even if I might just tweak a few names to my own preferences. Our text injector uses DTE tiles. Hit me up if you need the table file. Thanks! I will definitely take you up on that! Copy this to text file and change its extension to .tbl. I use Windhex for manual edits. I can't promise you'll there will be enough space for everything you want to change. Kethinov just uploaded a few new hack and I think the most notable was this one. I dunno about having Watts in the Mana Fortress after you're changes to where orbs are obtainable but Neko (with additional frames) might be a nice convenience save point/store to consider adding to a future version. Love the spell changes too! Ablaze works a lot better. I remember hearing that although the gameplay of Evermore is handled similarly, it's almost 100% different from Secret of Mana under the hood. LOL. I remember the rumors back in the day that they made Evermore using SoM as an engine. Apparently, they did straight up copy a lot of concepts from SoM but implemented everything from scratch. -Reverted back to old punctuated message system. -Miniaturized was too long. It's system message was changed to "Shrank!" -Freeze was localized to Ice Smash to match later entries in the series. Also, I should note that I intend for this to be the final major release of this hack. I will release a corrective updates every few months for any typos that get reported. I have submitted v1.6 to Queue. 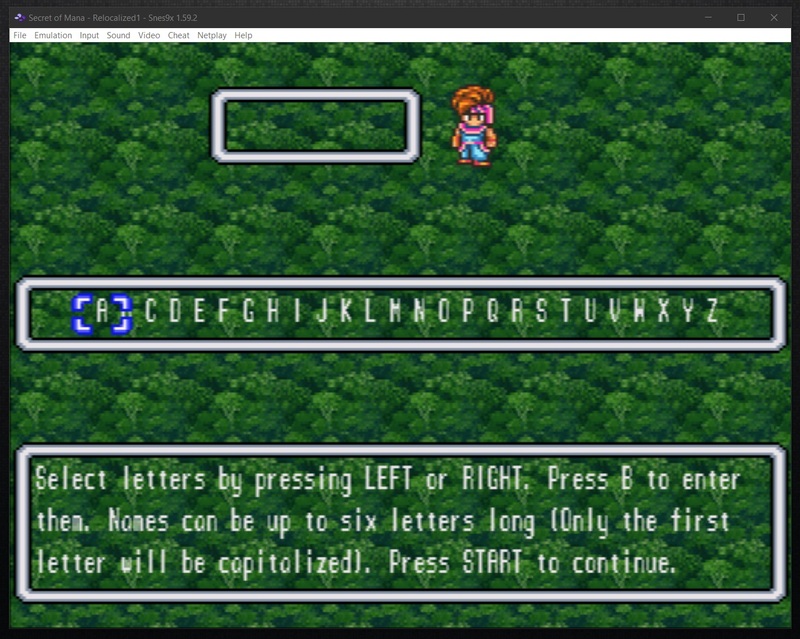 He should have that added to Secret of Mana: Turbo soon. Thanks to everyone who helped me make this thing and everyone who provided the much needed criticism and feedback needed to get it right. 1.6 is glitched, this is what I get after starting a new game and getting past he naming screen. Are you sure you applied it to a clean ROM? I just downloaded a copy of the hack from RHDN and it seems to be working fine. My heart, on the other hand, is beating like a racehorse's. 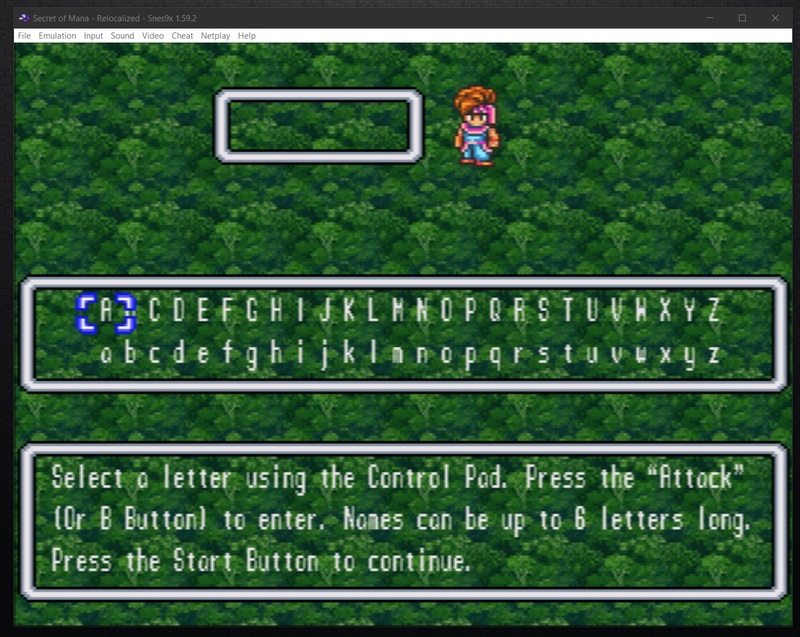 Yes, Secret of Mana (USA) with CRC32 D0176B24, that is with no header. I even tried patching a FuSoYa’s pre-patched rom after removing the header for it because that was the old instructions. I don't know what to tell you. It seems to be working for me. Is anyone else having this problem? Don't know what to tell you either, v1.5 works fine. Guess we'll wait for others to chime in. Nice to finally see proper casing for naming yourself. That's the one thing I had left on my list of stuff SoM needed. 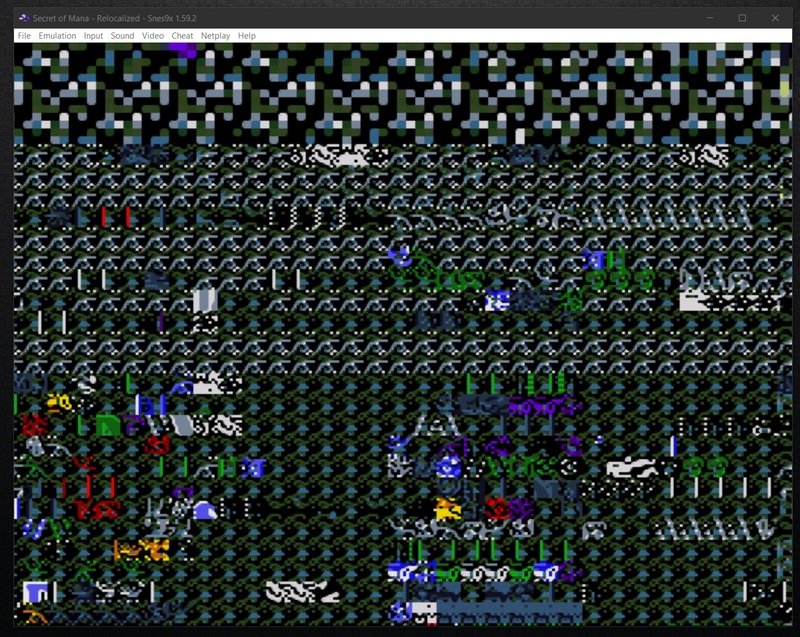 Patching the new version alone seems to work fine here. I ran it through the intro with no issues.